This blog focuses on three elements of impact; enrollment growth, student outcomes and wider economic impact. The detailed case studies for Oregon State University (OSU), University of South Florida (USF) and Newcastle University also cover student diversity and student experience measures. 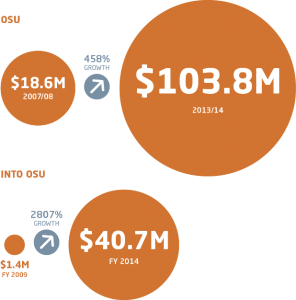 The data below, which examines the Fall Enrollment profiles of OSU and USF, clearly indicates an inflection point in accelerated international enrollments coinciding with the establishment of the partnership with INTO. 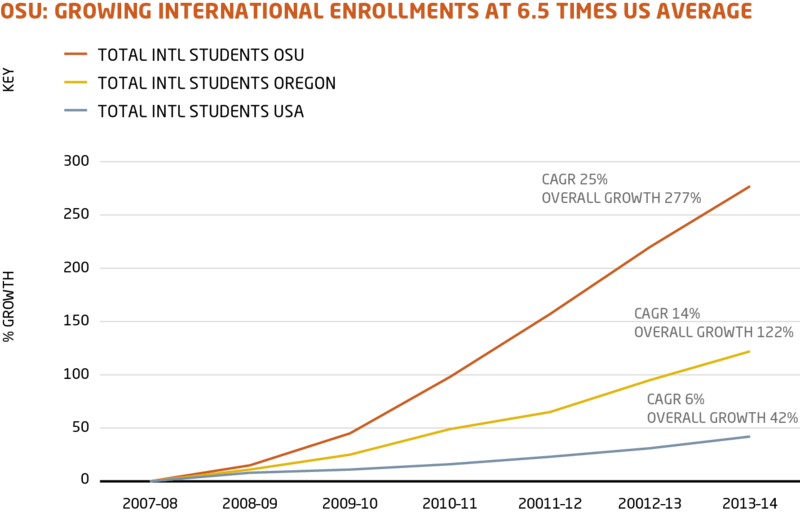 But is this spike in enrollments a reflection of broader dynamism in the US international market or is there another factor at play? To calculate the wider relative impact on enrollments, we took published data analyzed and presented by the NAFSA Economic Impact calculator tool, powered by Indiana University’s International Services department. This excellent resource provides an opportunity to benchmark international student enrollment performance for an institution against the State and place it in the wider context of the United States as a whole. 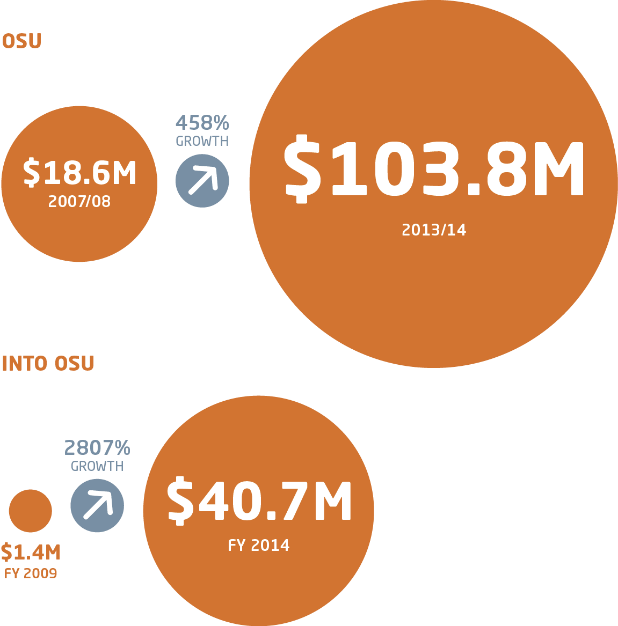 As this chart on OSU indicates, the University has grown international enrollments by 277% compared to 42% for the United States as a whole from 2007 to 2013/14. 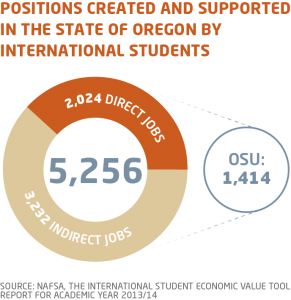 Indeed, according to a Brookings Institution report, the City of Corvallis where OSU is located recorded the fastest growth in F-1 visa students of any metropolitan area in the entire United States between 2008 and 2012. 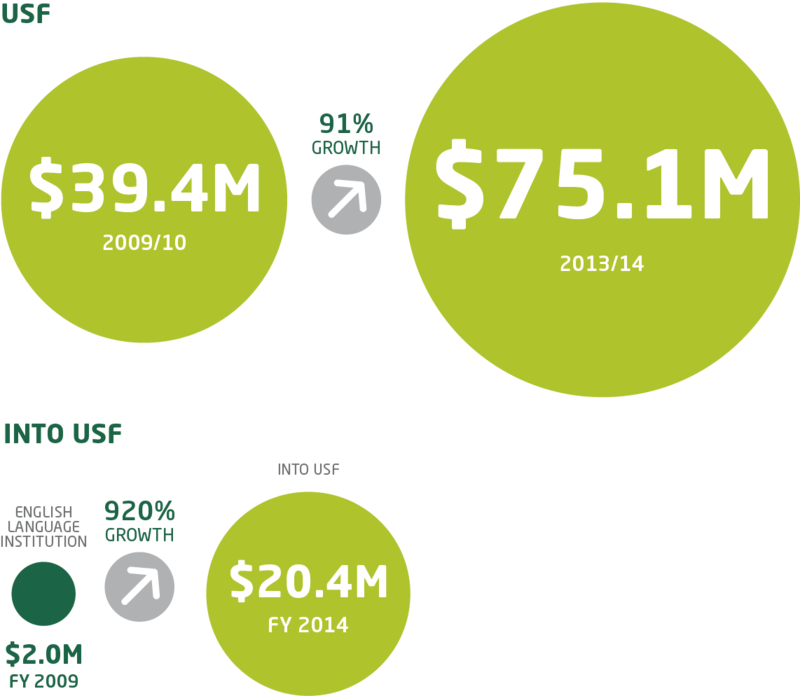 For USF which entered partnership a couple of years later, one can identify a similar trajectory and inflection point. The Higher Education Statistics Agency (HESA) provides comprehensive data sets on student enrollment and performance at British higher education institutions. We have use these data to calculate absolute and relative enrollment growth at our UK partners. The sample from Newcastle, below, supports the wider evidence of a strong partnership inflection point. 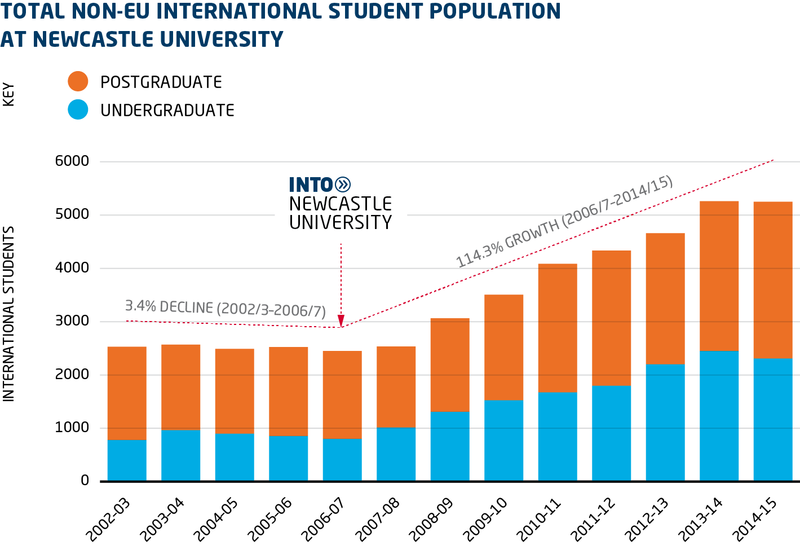 Since entering into partnership with INTO, the University has grown new non-EU student enrolments by 165% compared to a sector wide growth of 47%. It has also outperformed the growth rates of Russell Group universities, of which Newcastle University is a founder member. The same pattern is also evident at other INTO partners, the University of Exeter, University of East Anglia and, more recently, Queen’s University, Belfast. 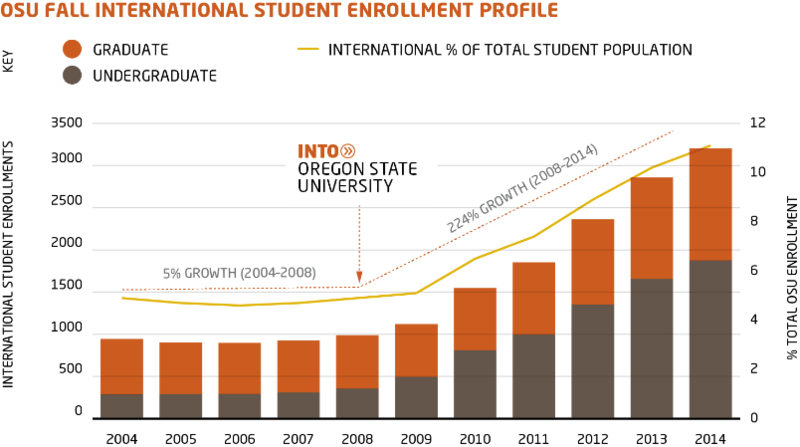 At undergraduate level, the growth is even more pronounced. 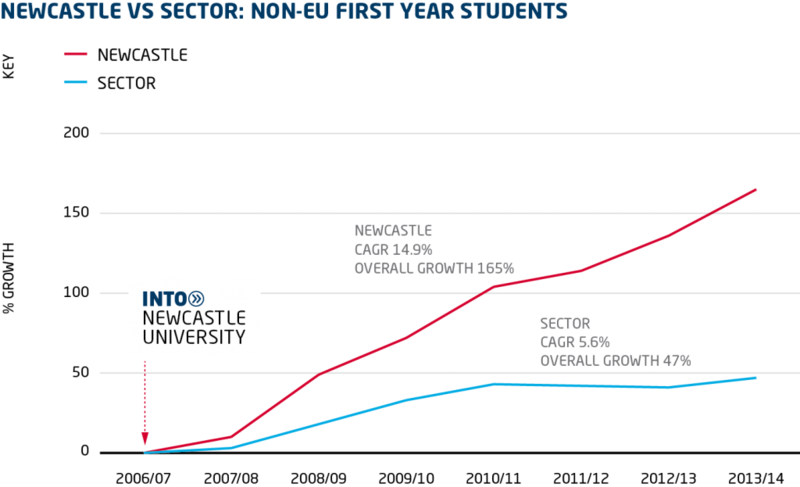 At Newcastle University, new non-EU undergraduate enrollments have grown by 316%. It is difficult to obtain truly comparable data on student performance and progression rates at pathway level. This is largely because there are no accepted standards and definitions across the wider sector. For our purposes, we have defined progression and outcomes based on students who have completed and enrolled in further study at the University – not students who have been made an offer to study, irrespective of their performance on the pathway program. Equally, student retention rates are defined as the percentage of students who, having intitially enrolled, go on to complete their programs. Once again there appears to be clear evidence on both sides of the Atlantic that international students who complete pathway programs at INTO partners perform well in their further study. For partnerships in the United States we measure the entry Grade Point Average (GPA) for students on Pathway programs, the average exit GPA and then the cumulative GPA of students on further undergraduate and graduate studies. Pathway students at both INTO OSU and INTO USF can enter at a GPA of 2.5. 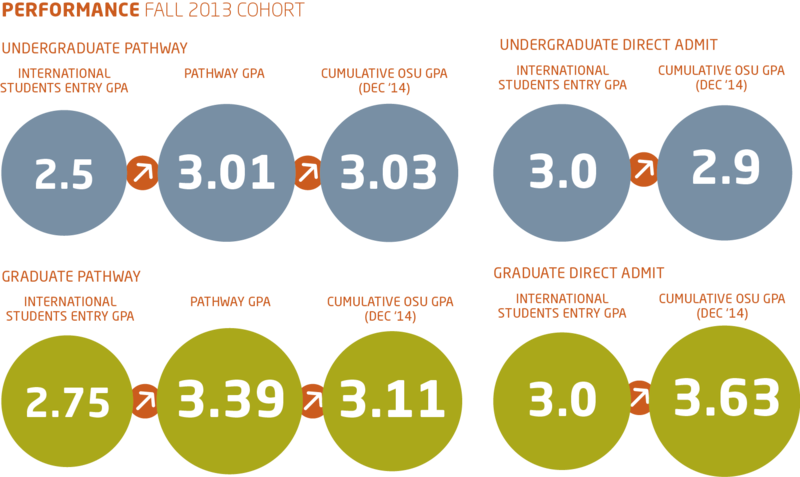 The average GPA for those students on a pathway is 3.01 and 3.12 respectively. As they continue with their undergraduate studies, the cumulative GPA scores sit at 3.03 for OSU (better than direct admit international students) and 3.11 for USF. As in the United States, progression and performance are are based on the number of students who are admitted to and enroll on to further study at the partner University. 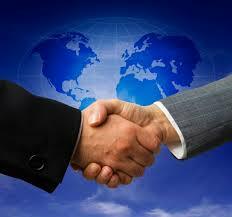 We can then track performance of those students as they progress through their further studies. Once again, the Newcastle University example illustrates this point. While the core driver of internationalization across the developed world ought to be on enriching student experience and enabling universities to fulfil their mission in an increasingly globalized world, there is no doubt that increased revenue plays a large part. The financial contribution which international students make to universities and thus support institutional mission is nevertheless a critical measure. 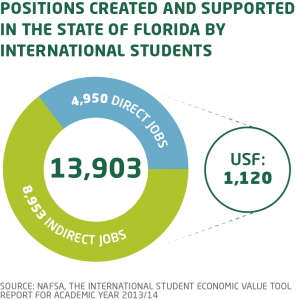 Once again, the NAFSA economic impact calculator provides institutions with a mechanism to illustrate both the fiscal value of international students to their institution and their state. Moreover, it also provides a useful estimate of the numbers of jobs supported, directly and indirectly by international students. 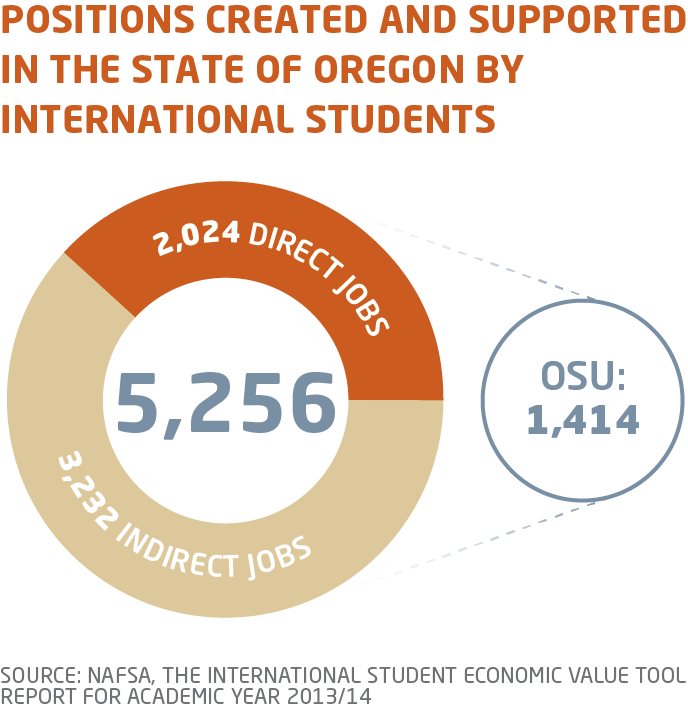 In the case of Oregon State University, NAFSA estimates that annual international student revenues have grown by 450% to $103.8M for the fiscal year 2013/14, supporting 1,400 jobs. 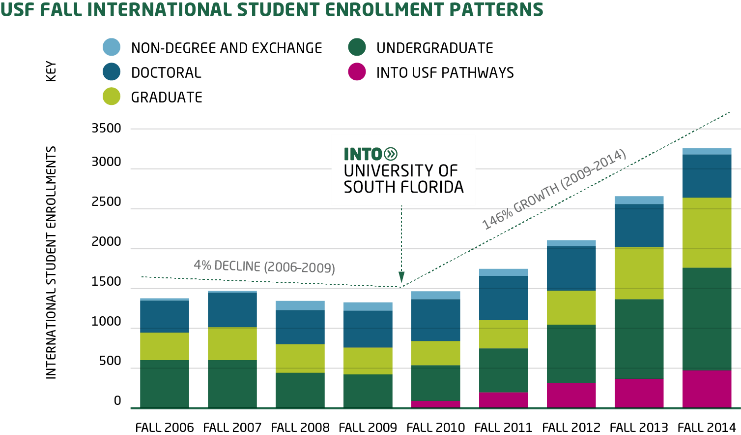 For the University of South Florida, revenues have grown by 91% to $75.1M in the four years of partnership with INTO. According to NAFSA, these revenues support more than 1,000 jobs. The UK doesn’t benefit from the NAFSA economic impact calculator, although Universities UK (UUK) and Oxford Economics’ study of the economic impact of international students at the University of Exeter do provide some guidance. Using the UUK methodology, this would suggest that the real figure of the wider impact is closer to £60M annually in Newcastle alone. Consider that INTO operates 23 partnerships, and a conservative estimate of the economic benefits of partnerships to our partner universities and the communities they serve would be in excess of $400M per year.